Throughout this entire NFL regular season, the Denver Broncos and the Oakland Raiders have made headlines on a seemingly weekly basis. With the Broncos finally handing the quarterback position over to fan favorite Tim Tebow and the Raiders seeing longtime owner Al Davis die suddenly and acquiring veteran quarterback Carson Palmer shortly after, a lot of people around the league have been keeping their eye on these two AFC West division rivals to see if they can turn things around. Unfortunately, despite new head coach John Fox finally going with Tim Tebow under center, the Denver Broncos have been doing much better as they have split the last two games against the Miami Dolphins and the Detroit Lions with Tebow at the helm. Both of these games were ugly in terms of Tebow’s accuracy and play under center, but the second-year quarterback was able to lead the Broncos to thrilling come-from-behind victory over the Dolphins that impressed quite a few people. Despite the come-from-behind win over Miami, the game against the Detroit Lions was another story altogether with the Denver Broncos getting dominated by Ndamukong Suh and company. Not only was Tebow completely taken out of this game by the Lions’ defense, but the former Heisman trophy seemed to play worse and worse as the game got out of reach. This performance against the Detroit Lions was bad enough to get people thinking that Tim Tebow might end up back on the bench sooner rather than later. The one thing that makes things interesting with Tebow under center is the fact that the media is either praising him or tearing him apart. This is quite uncommon for basically rookie quarterback who has no experience or much time under center as the starter. As for the Oakland Raiders, things seem to be on the up-and-up after they acquired veteran quarterback quarterback Carson Palmer via trade from the Cincinnati Bengals. Even though Palmer was awful in his debut in the loss to the division rival Kansas City Chiefs in which he threw three interceptions in just one half of play, the veteran gunslinger hadn’t play all season long and likely to be rusty. In Week 9, Carson Palmer will try to get off to a fresh start as the Oakland Raiders starting quarterback and should have a solid shot of getting his first win with his new team. The Denver Broncos might be a bit better on defense this season with the second overall pick Von Miller leading the way, but they will almost certainly be no match for the potent offense of the Oakland Raiders if Carson Palmer and running back Darren McFadden can get going early and often. 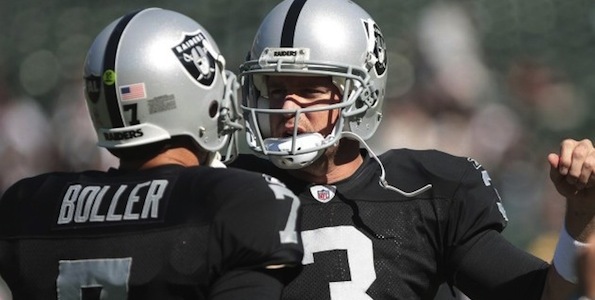 As of right now, the Oakland Raiders are heavy favorites to get the win at home in Week 9 with a -9 point spread. This spread is higher than anticipated, but still fairly solid considering the competition. Take the Raiders at -9. « Are the Philadelphia Eagles back on track after win over Dallas Cowboys?